The numbers are unrepeatable: 100 vehicles from 100 years; 61 different marques; and a once in a lifetime event. Such is the scale of the VACC Centennial Cavalcade and Show ’n Shine it is believed an event like this has never before been attempted anywhere in the world. In celebration of 100 years of the Victorian Automobile Chamber of Commerce (VACC), on 22 September the VACC Centennial Cavalcade will set off from Calder Park Raceway, featuring cars, commercials, trucks and motorcycles, highlighting a centenary of Australian motoring (1918-2018). Waved off by event ambassador and participant, Shane Jacobson, the VACC Centennial Cavalcade will depart from Calder Park in Melbourne’s north and be led up Calder Freeway by a 1918 Buick Roadster. There are many other special vehicles in the 100-vehicle lineup. Highlights include the 1969 Aston Martin DBS Vantage used in the James Bond movie, On Her Majesty’s Secret Service; the 1947 Rover P2 Sports Saloon featured in The Dressmaker; the 1932 Chrysler Imperial owned by gangster Legs Diamond; a unique 1939 Hanomag Beetle prototype; a rare Welsh-built 1965 Gilbern GT1800; a 1968 Holden Dealer Team HK 327 GTS Monaro with Bathurst history; and a 1994 HSV GTS Mobil P Brock 002, one of only three special cars built as prize giveaways for Mobil Oil. Various military vehicles include a 1943 Dodge Command Car, 1944 Mack Truck prime mover capable of carrying a heavy tank, and a 1945 Willys Jeep. There will also be vehicles from historic fire, police and ambulance services; even a hearse. Other notable vehicles include a 1923 Single Door Fiat Gentleman’s Roadster, 1925 12/50 Alvis, 1927 Rolls-Royce Phantom 1, 1936 DeSoto S1 Airstream Deluxe, 1952 Austin Loadster Motorhome, 1954 Austin-Healey 100S, 1956 Alfa Romeo Giulietta Spyder, 1957 Mercedes-Benz 300SL ‘Gullwing’, 1958 Lancia B24 Aurelia Convertible, 1975 Leyland Force 7, 1986 Ferrari Testarossa, 2016 Toyota Mirai Hydrogen Coupe, and 2018 BMW i8 electric Roadster. 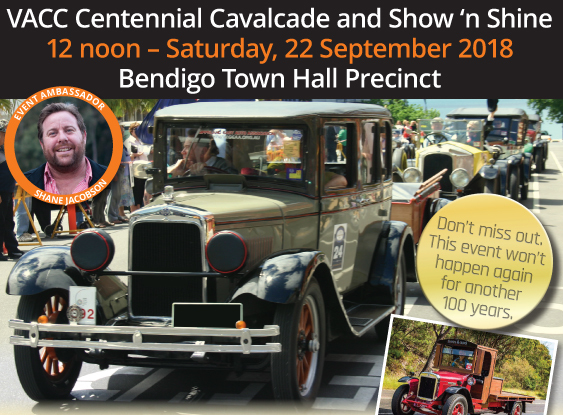 When: Saturday, 22 September 2018 (7am arrival of vehicles; 8.30am cavalcade flag fall; 11am arrival at Bendigo; midday onwards public reception and VACC Centennial Show ’n Shine; 4pm event concludes). Where: Starts Calder Park Raceway, Calder Freeway, Calder Park; concludes Bendigo Town Hall precinct.